David Fabbo can craft a natural real look of stone at a great price. 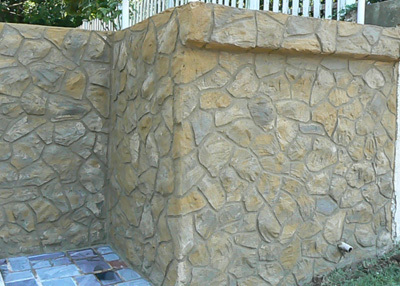 Once the cement is applied and set in, Tri-State Brickface can design different looks of stone including Earth stone, Ashler Stone, and Castle Block. Step Two: The second coat of cement (joint coat) is applied and allowed to set. Step Three: The third final application is the finish color coat. Immediately following the application, heavy lumps of cement are tossed on the wall, which then are spread around the wall with a dry brush. Once this coat has set in, the design and texture of your choice is cut in deep enough to reveal the mortar coat (joint). Step Four: Any final color that the customer desires can be spotted or rolled on with a brush giving the customer the ideal stone they desire. Colors are mixed with certain pigments, cement, sand, and water. The colors do not rust, fade, or wash off.